An exceptional 5 bedroom, 4 bathroom executive double fronted 3 storey detached by Bovis Homes located within an exclusive quiet cul-de-sac setting with detached double garage, 2 car drive and good size garden. 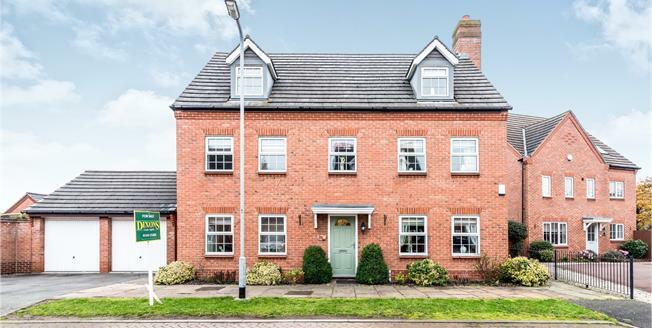 The interior features a huge square reception hall, guest cloakroom, impressive through lounge, a superb open plan living space including breakfast/kitchen and dining room/sitting room, separate laundry/utility. 1st floor gallery landing serving 4 excellent bedrooms with 2 en-suite and one family bathroom. The top floor is devoted to a hugely impressive master bedroom suite with double bedroom/sitting room, dressing room/wardrobe room with excellent storage and a large double shower room. Outside there is a wide frontage with 2 car drive and detached double garage, a large lawned rear garden with flagged patio.